Most experts think of hypnosis as a way to reach directly into the subconscious mind. The conscious mind is calmed and subdued as you enter the trance state so it starts to take a backseat in your thinking processes. The subconscious mind is full of imagination and impulsivity, so that without the inhibition usually imposed by the conscious mind, a subject under hypnosis becomes more childlike, playful and imaginative and therefore more ready to accept strange suggestions. What's Going on in a Hypnotised Brain? Research hasn't shown any physical changes in hypnotic subjects, but there are changes in brain activity. Electroencephalograms (EEGs) measure brain electrical activity or brain waves through electrodes strapped to a subject's head. Brain waves show different patterns depending on the mental state of the subject. Relaxation, alertness, deep sleep and rapid eye movement (REM) sleep when we dream all have characteristic EEG findings, as do diseases like epilepsy. EEGs of hypnotised subjects tend to show lots of the low frequency waves seen in dreaming and sleep, and less of the high frequency waves associated with wakefulness. There's also more electrical activity in the right side rather than the left side of the brain. The right side is generally believed by neurologists to control imagination and creativity, while the left side deals with logic and reasoning. All this fits in with the theory of the subconscious mind stepping forward while the conscious takes a backseat. Hypnosis can exploit the relaxation of the usual inhibitions and denials that the conscious mind imposes. By gaining access to the subconscious, hypnosis is used, with varying degrees of success, to help break habits like smoking or overeating. 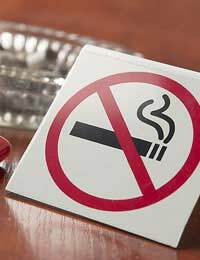 Sometimes the hypnotist tries to connect a negative response with the bad habit, like telling your subconscious that you'll feel sick every time you think about cigarettes. Another method is to try to convince your subconscious that in fact you'll do better without cigarettes, thereby building up your willpower. Many psychiatrists use hypnosis as part of therapy in order to tackle entrenched personal problems like phobias, in which the subject has deep, irrational, very specific fears that they find it hard to control consciously. The use of hypnosis to gain access to "repressed memory" for therapeutic purposes is controversial. The subconscious mind is a storehouse of memories which can be retrieved under hypnosis, but the hypersuggestibility state makes it hard to distinguish between true memory retrieval and false memory creation which can have disastrous consequences. This has been seen most notably and horribly in cases of "remembered" child abuse that turned out later, at tremendous cost to the individuals and families concerned, to have been false memories. For the same reasons, the concept of "forensic hypnotherapy" is widely viewed with suspicion. The idea is that witnesses or victims of crimes are hypnotised in order to remember key facts that they are subconsciously unaware of. But, despite the best of intentions by all concerned, how can we know which memories are accurate? On the other hand, in the context of personal psychotherapy, when used professionally by a trained psychiatrist, accessing of buried fears, memories and repressed emotions by hypnosis can help to clarify and bring resolution to difficult and persistent problems. Some claim that hypnotic suggestion can ease pain and even cure illness, and it has been used by women in childbirth and even to help manage the pain of cancer chemotherapy. Do You Ever Get the Feeling Of Déjà vu? One of the most sensational aspects of hypnotism is the claim that many people have, under hypnosis, remembered their past lives. A 1950s Colorado housewife, Virginia Tighe, was the first such claim to receive worldwide media attention, when she was hypnotised by a neighbour, and "remembered" a previous existence, as Bridey Murphy, a 19th century Irish woman from Cork. Her "memories" included many details that believers thought she could never have invented and she began to speak in an authentic Irish brogue when under hypnosis. These features are common to such cases and there are even individuals who, under hypnosis, speak a foreign language with native fluency, with which, in their present incarnations, they are totally unfamiliar. But the news is not so good for those of us who've always harboured a secret hankering to discover royal or adventurous past lives under hypnosis. Every time that a past life regression story has been thoroughly investigated, deeply buried present life memories, along with a fair dollop of subconscious confabulation (gap filling), has been discovered to account for the detailed "memories." For example, in the case of Bridey Murphy, a persistent journalist eventually unearthed a real Bridey Murphy Corkell who'd lived across the road from Virginia when she was a small child. No-one doubts that hypnosis seems to give access to remarkably detailed buried or repressed memories, even from very early childhood, that the subject was totally unaware of. The "memories" revealed in past life regression certainly give us remarkable evidence of the incredible retentive and imaginative capacity of the human brain. But so far there's no convincing evidence that remembered past lives really happened.